It’s never good business to lose part of your inventory whether it be to shoplifting or employee negligence. But when your inventory can be deadly, it ratchets up the urgency to find that item. That was the case this past weekend at the Bronx Zoo. 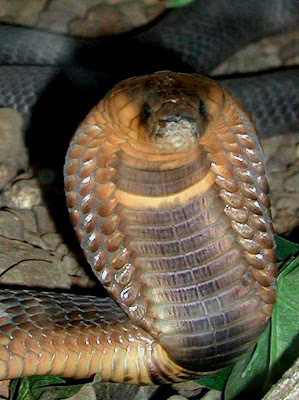 An Egyptian cobra came up missing, necessitating the closure of the entire Reptile House to the public. The snake, which was not part of a public display, came up missing from its habitat on Saturday. Zoo officials have reported the 20-inch poisonous snake has not made its way to areas of the park where patrons could have a dangerous encounter. That’s good because the cobra packs enough venom in a bite to kill a human in 15 minutes. Evan an animal as large as an elephant isn’t immune to the cobra’s punch. A full-grown pachyderm can only survive 3 hours after being bitten. The potent venom attacks the nervous system leading to paralysis which eventually shuts down the respiratory system. At least this has got to be better than a real-life Snakes on a Plane encounter. So until the officials give the all-clear signal, I’d be careful what I reach out to visit with in their petting zoo. Once they do wrangle the snake back into its cage, maybe they can turn it into an Internet sensation like Heidi the Cross-Eyed Possum.